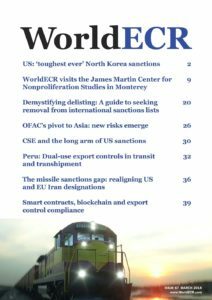 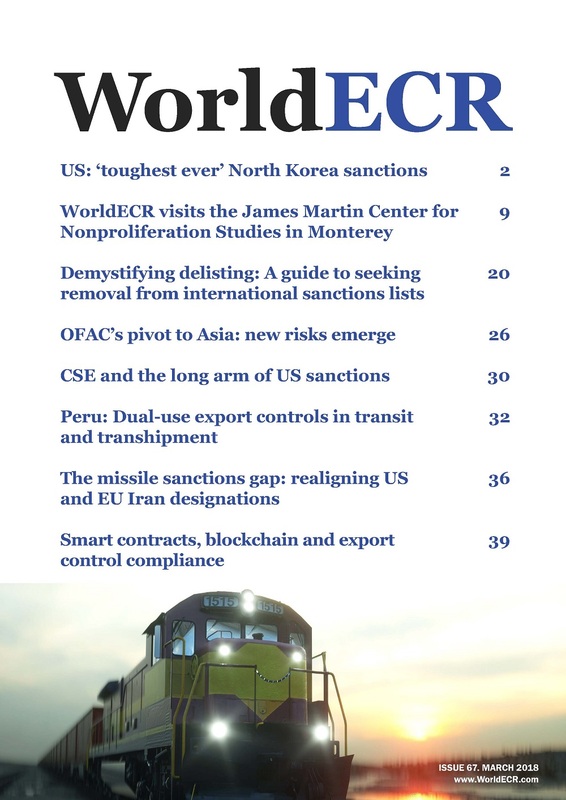 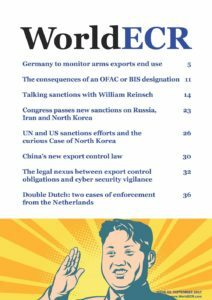 US: ‘toughest ever’ North Korea sanctions * WorldECR visits the James Martin Center for Nonproliferation Studies in Monterey * Demystifying delisting: A guide to seeking removal from.. 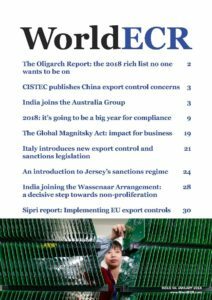 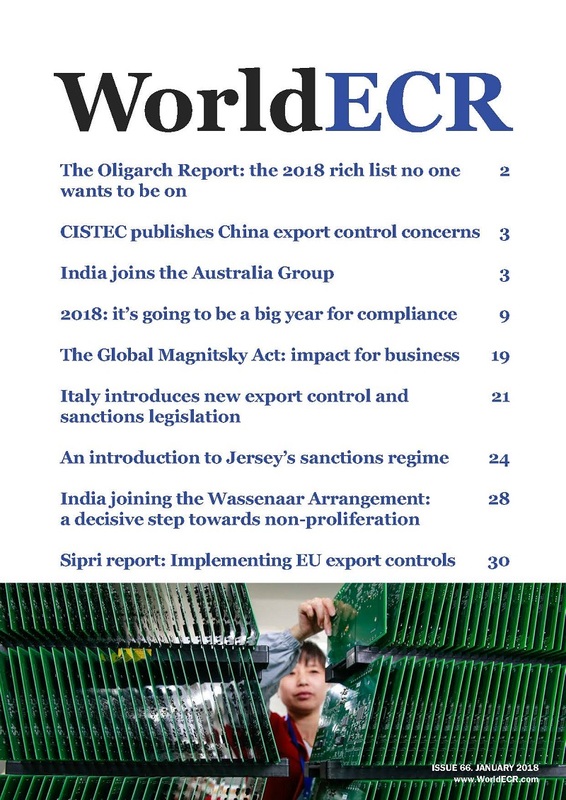 The Oligarch Report: the 2018 rich list no one wants to be on * CISTEC publishes China export control concerns * India joins the Australia Group * The Global Magnitsky Act: impact for business *.. 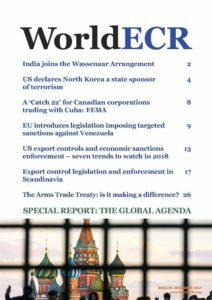 US export controls and economic sanctions enforcement – seven trends to watch in 2018 * Export control legislation and enforcement in Scandinavia * The Arms Trade Treaty: is it making a difference?.. 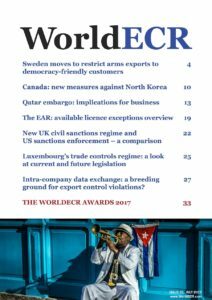 Balancing frustration and optimism in trade with Iran * Enforcement of economic sanctions in France * Significant US sanctions developments under the Trump Administration * National emergency creep..
European Parliament votes for tougher EU arms export control regime * US government revokes Sudan sanctions * Malaysia’s Strategic Trade (Amendment Act) * Implications of recent US Venezuelan..
Germany to monitor arms exports end use * The consequences of an OFAC or BIS designation * Talking sanctions with William Reinsch * The legal nexus between export control obligations and cyber.. 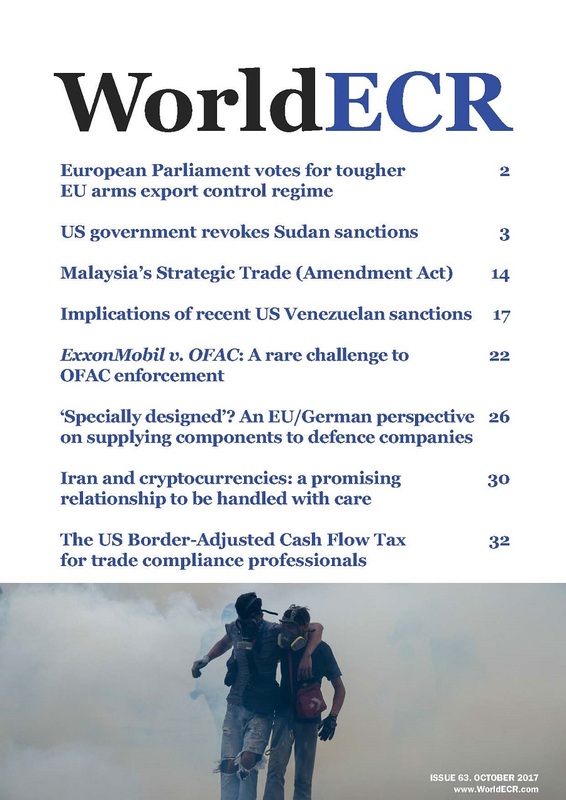 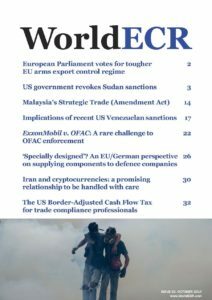 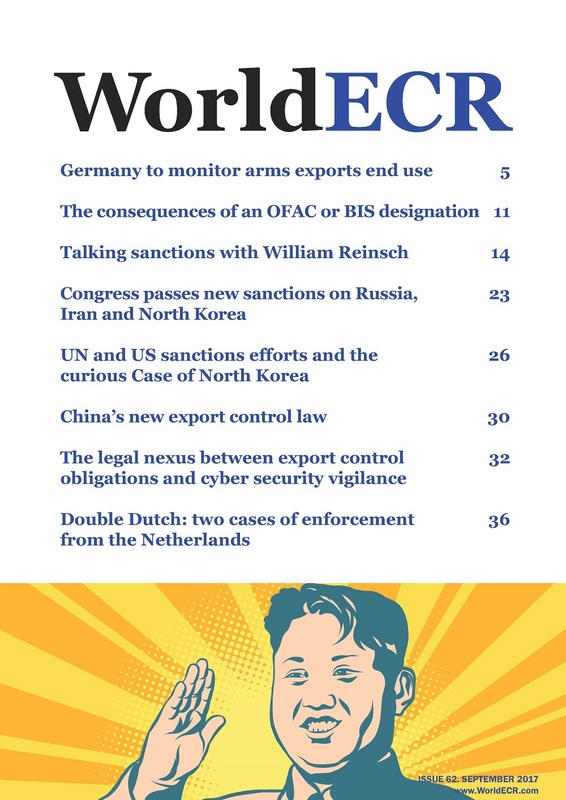 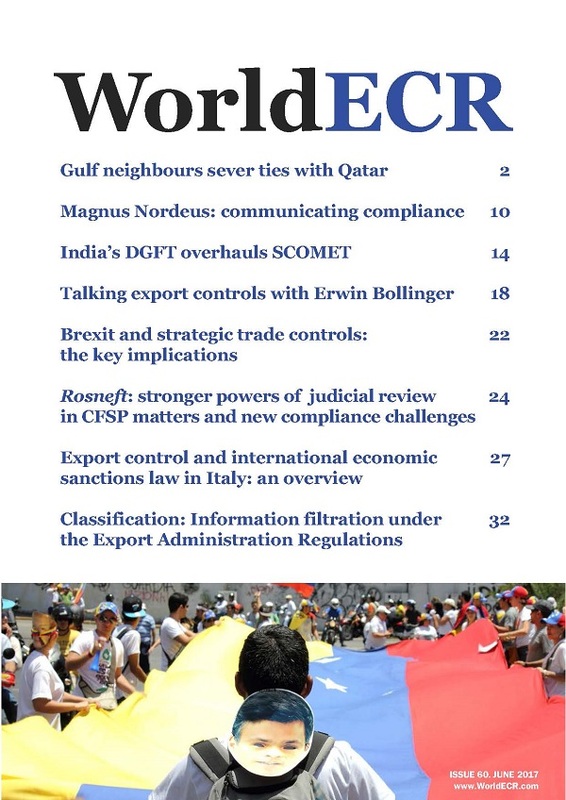 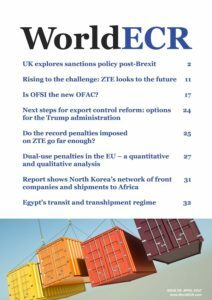 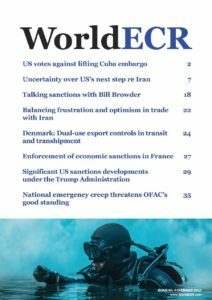 THE WORLDECR AWARDS 2017 * Sweden moves to restrict arms exports to democracy-friendly customers * Intra-company data exchange: a breeding ground for export control violations * Canada: new measures..
India’s DGFT overhauls SCOMET * Gulf neighbours sever ties with Qatar * Brexit and strategic trade controls: the key implications * Export control and international economic sanctions law in..
UK explores sanctions policy post-Brexit * Rising to the challenge: ZTE looks to the future * Is OFSI the new OFAC? 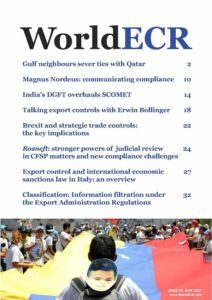 * Egypt’s transit and transhipment regime * Next steps for export control.. 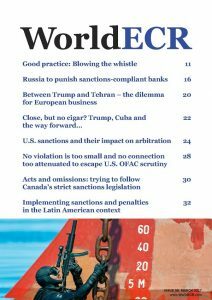 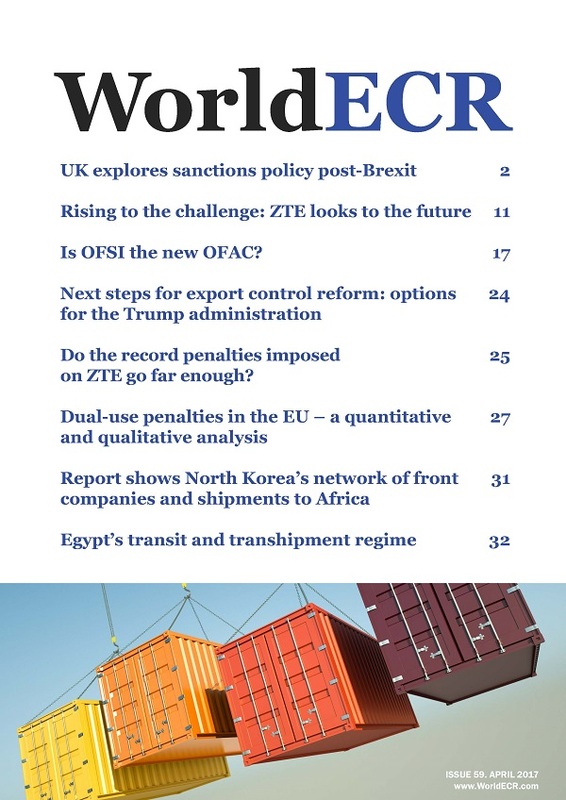 Between Trump and Tehran – the dilemma for European business * U.S. sanctions and their impact on arbitration * No violation is too small and no connection too attenuated to escape U.S. OFAC..